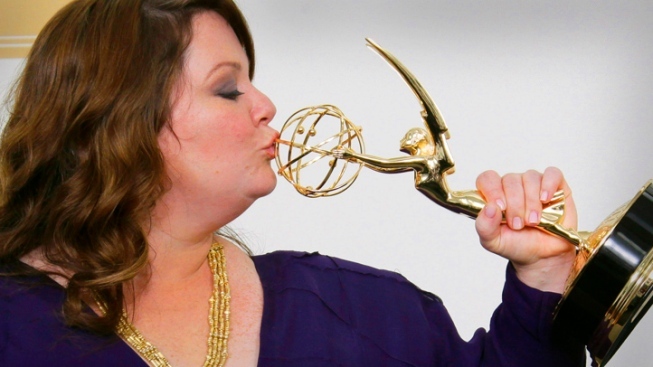 "Mike & Molly" cast member Melissa McCarthy puckers up to her Emmy for best lead actress in a comedy series at last year's ceremony. With some old shows retuning to eligibility and some new shows grabbing all manner of headlines and eyeballs, this year's Emmy races feel a little more wide open than usual. "Scandal" star Kerry Washington and Nick Offerman of "Parks & Recreation" will announce the nominees for 64th Annual Emmy Awards at 8:40 am ET Thursday, which will be streamed live at Emmys.com. "Mad Men," AMC's hit series set in the '60s, hopes this year to become the first series win a fifth Best Drama award, breaking its tie with erstwhile NBC series "Hill Street Blues," "L.A. Law," and "The West Wing." Standing in its path could be Showtime's "Homeland," the spy thriller that won Best Drama at the Golden Globes earlier this year, where series star Claire Danes also took Best Actress in a Drama. After a year in which "Breaking Bad" was ineligible because of its scheduling, you can expect the show and star Bryan Cranston back in the awards mix. This news has to be disheartening for "Mad Men" star Jon Hamm. Having lost to Cranston three years in a row, Hamm looked like a lock to win his first Best Actor Emmy last year, only to have "Friday Night Lights" star Kyle Chandler swoop in to take the prize. Will Hamm finally overcome Cranston? Beyond those three likely Drama nominees, things get a little hazy. "Game of Thrones" seems like a slam-dunk, as do "Boardwalk Empire" and "The Good Wife". But what of old favorites like "Dexter," "Justified" and "House," just to name a few? That's nine shows and there are only six slots—someone's gonna be disappointed. "Boardwalk Empire" won eight Emmys last year, more than any other Drama, but seems unlikely to repeat that haul, as six of its wins from 2011 were for the pilot, which was directed by Martin Scorsese. On the comedy side of the aisle, "Modern Family" is a lock to get a chance to defend its back-to-back titles, while "30 Rock," "The Big Bang Theory" and "Parks & Recreation" will all likely hear their names called. Also back in the running after a year of ineligibility is "Curb Your Enthusiasm," which has previously gotten six nods without a win. 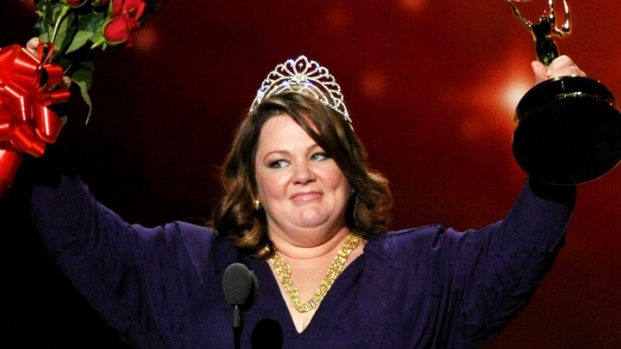 Among the individual awards, Melissa McCarthy looks to defend last year's surprise Best Actress in a Comedy win for "Mike and Molly," Jim Parsons will seek a three-peat for Best Actor, and Ed O'Neill hopes to get some love after last year, when seemingly all of his "Modern Family" co-stars were nominated and he wasn't. The most interesting name to listen for will be HBO's "Girls," the most talked about new comedy in a very long time. Creator-writer-director-producer-star Lena Dunham's raw, frank, absurd and often bleak portrait of four 20-something women trying to make their way in New York City was loved or hated by all who saw it—nobody walked away with a shrug. Also hoping to get the call will be "Louie," another NYC-based series driven by a singular vision, that of comedian Louis CK. And this is to say nothing of Emmy stalwart Julia Louise Dreyfuss' new series "Veep," the Fox hit "New Girl," starring Zooey Deschanel, and the first season of "The Office" in the post Steve Carell era. Last year "Downton Abbey" took home six Emmys, and is sure to receive another bushel of nominations. Though the Dowager and friends don’t seem to have any one opponent in the miniseries/TV movie category as daunting as last year's "Mildred Pierce" (21 nominations) there's still no shortage of contenders. "Glee" creator Ryan Murphy's modern Gothic mind warp "American Horror Story," HBO's "Game Change," about the McCain/Palin run for the White House, and the ratings blockbuster "Hatfields and McCoys," starring Kevin Costner, will all receive nods, as will "Hemingway and Gellhorn," starring Clive Owen and Nicole Kidman, "Luther," starring Idris Elba, and two newspaper dramas, "Page Eight" and "The Hour." The 64th Emmy Awards will air Sunday, Sept. 23, on ABC, hosted by Jimmy Kimmel live from the Nokia Theater in Los Angeles.